You are here: Home > T-Mobile Sending Out Carrier Update Enabling LTE For Unlocked iPhone Devices On April 5th? T-Mobile Sending Out Carrier Update Enabling LTE For Unlocked iPhone Devices On April 5th? Update: As some of you have mentioned, there is no mention of LTE specifically in the body of the image below. Word from our sources is that this carrier update will enable LTE and it makes sense, given that seven LTE markets are live and a carrier .ipcc update is all that’s required to do so. As T-Mobile customers using unlocked AT&T or unlocked iPhone devices have had some lingering questions regarding their current device and LTE capability, we’re happy to finally provide an answer. News just hit my inbox that T-Mobile is sending out a carrier update on April 5th enabling LTE and Visual Voicemail among other features. Given that this is an Apple update, there’s no staggered rollout as the update hits iTunes or all iPhone devices around the same time. T-Mobile’s LTE-ready iPhone 5 launches April 12th. I hope to have a more detailed look at what’s contained within the “network/device optimizations” very soon so check back as we learn more. If you are absolutely desperate to enable LTE now, jailbroken iPhone users can follow these instructions. Great news for the iPhone users. I’m an Android user, but its exciting for Tmo and just consumers to have more options on the Magenta network. I already know a handful of people switching from a competing carrier to Tmo. Good stuff. T-Mobile should send AT&T the results of the number of people who are downloading this update as a good foreshadowing. It’s not a matter of how many are “downloading the update” since it’s automatic. T-Mobile isn’t shy about posting how many iPhone users they have on their network. The huge majority of those iPhones were either from AT&T or unlocked. The update comes from Apple not T-Mobile. It wasn’t specific…which iPhones will be receiving the update? All (4/4s) or just the iPhone 5? 6.1 or higher. That means all iPhones except the 2G and 3G can get this update. Correct. The iPhone 5 is the only model that can and will benefit from the LTE part of the update. Visual voicemail should come for the 3GS, 4 and 4S. It seems likely that our iPhones 3GS, 4, 4S and 5 will also start saying “4G” when we’re in 1900 MHz refarmed areas. Hopefully this means I get better service around town, but I have a feeling it doesn’t. Sadness ensues. Oh well I have made plans to sell the A1428 model iPhone 5 and purchase a T-Mobile version. According to the store guys, it will get just as good service as my girlfriends Galaxy S3. She gets 4G (HPSA+) where I get Edge only. So if that’s the case it’ll be much more bearable to use. That is true because your current iPhone only supports HSPA+ on 1900 (as far as compatibility with T-Mobile goes) rather than both 1700/1900. Awesome, well I will continue with my plans to sell. Thanks for the info! what about our jailbreak iphone 5 and stuff, will that be affected? If it’s just a carrier update, it won’t effect anything concerning the jailbreak. how would we install it? No action needed. You’ll just see a popup saying a carrier update was installed. I recently got one for my iPad mini running on Verizon. easier especially in areas where I don’t have 1900 band available. Glad to get this update, but this means no more free tethering. The new plans pretty much all include at least some tethering. All but the unlimited plan allows you to tether up to your allotment of 4G data, then it drops to EDGE. Everyone considering buying a Windows Phone should observe recent events. Gray market iPhones get an LTE update, but T-Mobile’s own Lumia 810 doesn’t? What a joke! Carriers don’t give a rat’s @ss about Windows Phone and refuse to support it. Caveat emptor. Wrong, wrong, wrong…nobody ever promised the LTE update on the 810. I don’t have any problem with this since no promise was ever made. It’s one thing if that wasn’t true, but it is. Engadget says that they were told by T-Mobile representatives months ago that the 810 would be getting an update. Is Engadget lying? So you believe everything you read on the web…much less Engadget? No, but I tend to believe plausible information when delivered by reputable news sources – Engadget meets those criteria, in my opinion. I also object to the idea that PR that is distributed “under the table” to journalists and bloggers is somehow immune to the accountability associated with official press releases. Microsoft, for example, has conducted 95% (at least) of its Windows Phone campaign by means of leaks through parties such as Mary-Jo Foley and Paul Thurrott. The idea that PR-by-leak is some kind of “get out of jail free” card for companies who don’t keep their promises is a joke, especially when they had all the time in the world to correct any misunderstandings. I just wish HTC and T-Mobile would give the HD7 it’s 7.8 upgrade. They won’t even do that which is pathetic and i will not buy another Windows Phone again because of it . If i can’t get that simple upgrade then i’m not going to buy a WP8 and be left hanging when they decide to abandon it as well. To be fair, HTC and T-Mobile are not the only ones dragging their feet on 7.8, Samsung and AT&T are just as guilty. I keep my Samsung Focus in a shoebox in the closet so that I never have to see it and be reminded of the $500 (no contract) I wasted on Windows Phone. Broken promises and “anticipointment” for updates that never come are hallmarks of the Windows Phone experience! People all around the world are getting the 7.8 upgrade for the last few months. And you can get it through cab files a XDA which a lot of USA T-Mobile customers have already done and down loaded it. But i should’nt have to hack or modify my T-Mobile phone for such simple upgrade , T-Mobile and HTC should just release it OTA but they won’t because they want you to buy a new phone so they make more money. That’s bad business and giving your loyal WP customers the middle finger over greed. As I said, I believe it was the act of an errant PR statement that was taken as gospel. Even then the entire quote was never posted, only that they were “told” that it was coming. Engadget went on the best information they had, I don’t blame them, I blame whoever told them. David I thought the FCC Filings showed LTE onboard? I could be wrong! Consider everything rumor unless tmobile says otherwise. You cant take a tech blogs word as gospel. Normally I would take David’s side on this, if it was not officially announced then no foul. But in this set of circumstances, I can’t help but feel that T-Mobile is in the wrong. If the hardware supports it and they COULD roll out a software update to enable it, why wouldn’t they other than “lol buy new phone?” Especially considering someone in PR “let it slip” that they would. Not a step in the right direction. April 5th is the pre order date right? Will this enable group messaging? I personally hate group messaging. If you receive one, everyone who it was originally sent to starts blowing up your phone with replies. I tell everyone I know with an iPhone to turn it off. You can send messages to multiple people without Group Messaging enabled. Group messaging already works. It just uses MMS. You just need to have it enabled in settings. I dont have an option in settings. Where is it? Just enable MMS Messaging and group messaging will work. It does work flawlessly when everyone in the group has the iPhone. But if there are people in the group message without an iphone when you receive a response it comes up as an individual text and not in the group. I have this problem and I think this is what VinnyMac meant when he said it was not working properly. You can’t fix how other phones send replies (it is usually sent as individual sms replies). Can someone confirm if I understand this correctly. If I already have an AT&T Factory Unlocked iPhone 5 this update will enable The LTE 1700Mhz frequency. But if I am in an area that does not have LTE will it still work on the HSPA+ Network or will I still be on edge? You’ll have to be in a refarmed 1900MHz HSPA+ area for that to work. If you are currently stuck on EDGE, you’ll still be stuck on EDGE until T-Mobile updates your area with 1900MHz. So is the LTE 1700Mhz different from the HSPA+ 1700Mhz frequency? Correct. LTE AWS is currently supported, and that’s what AT&T uses for LTE. HSPA+ AWS on 1700MHz isn’t supported. 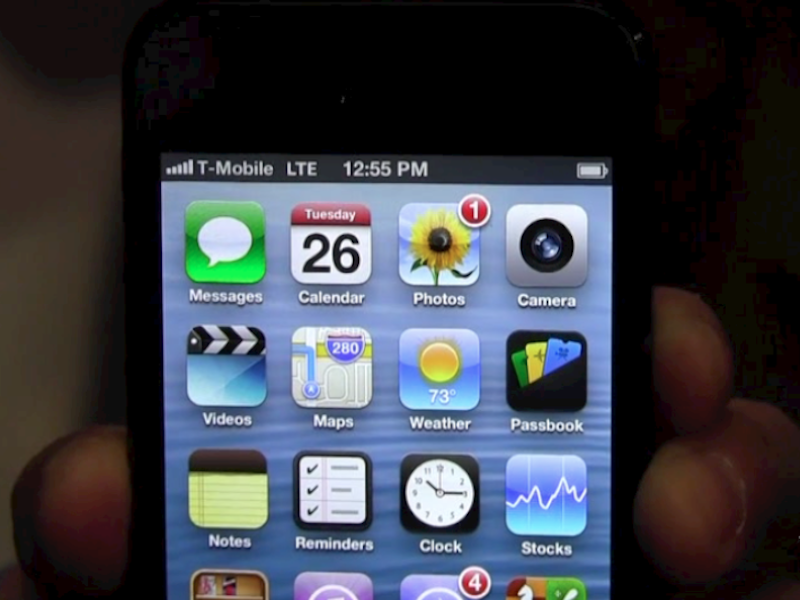 What about the Verizon version of the iPhone 5 (A1429)? The article stated the update will bring the LTE 1700Mhz frequency to all unlocked iPhone 5’s. The Verizon version came factory unlocked. I’m in Atlanta and in a refarmed 1900Mhz area, but LTE hasn’t been rolled out yet here. What changes will I see? You won’t gain LTE on an A1429 iPhone 5. That model supports LTE on bands 1, 3, 5, 13, and 25. T-Mobile’s only LTE band is band 4. I understand about LTE but would I be able to gain T-Mobile’s HSPA+ network? There are pockets in the city (I would guess in an city) where the phone switches from the 1900Mhz frequency (illustrated by the “3G”) back to 2G EDGE. Will that change with the update or will that remain the same since the phone is the A1429? When you get the “3G” symbol right now, you’re on the 1900 MHz network (which is all HSPA+). That won’t be affected by the carrier update. You’ll still be able to get on HSPA+ in a refarmed area. Hopefully this means we’ll see big strides in LTE towers in the launch cities going online between now and then. Not expecting any new cities even though at least 3 cities not on the launch list are showing LTE towers on Sensorly. I’m in the DC Metro and LTE is still spotty even though I’m noticing new LTE areas everyday albeit they have at best 1 bar of signal band less than blazing bandwidth. that’s because they’re testing in more cities. They probably won’t be officially lit up for another month or two. I figured that but also for example I live in the outer suburbs of DC and at this point some of our towers are behaving like they are in testing phase. And the T-Mobile GalaxyS3 ? It’s been reported several times that the T-mobile version of the S3 doesn’t support LTE. It won’t be getting an update. There will be an LTE version. Unless they scraped the GS3 lte because the GS4 is coming out in a month. I was just wondering because we had that option and the last update took it off. Anyway, I guess it’s on to the SGS4. This is great news for all using these devices, considering the pending April 12th launch, this clearly shows T-Mobile values these customers, not just the ones that will make a new iPhone purchase. I’ve been getting plenty of contact from several people within T-Mobile since I sent an email to Mr. Legere (including him personally) with some concerns I have. They seem great about reaching out to customers (and potential customers) with concerns. I wonder if this means we’ll lose access to APN settings, or will T-Mobile leave that part open? It’s dependent on the SIM card carrier wether or not you have access. If this disables access to the APN settings, it’ll make life miserable for people who need to do a T-Mobile SIM swap to get into the settings for other carriers, like Straight Talk, Net10 etc, that run on AT&T’s network. AT&T blocks the APN settings via SIM. Of course it will disable setting APN settings. That’s the whole point of a carrier update. It will hardcode the APN settings, enable the LTE toggle, and enable visual voicemail. According to some posts I’ve read from iPhone users around the globe, it’s dependent on the carrier to block them. Several have reported easy access to APN settings, no matter which carrier SIM card they installed in unlocked iPhones. No major carrier in the US allows it. I highly doubt T-mobile will either. AT&T is the only other major GSM carrier in the US. Other than GSM MVNOs, none of the other carriers solely communicate with their network using SIM cards. Therefore, APN access for CDMA phones would be somewhat silly. After being with AT&T for many years, I know firsthand how they love to block everything they can. They’re almost as bad as Verizon. All LTE iPhone 5 devices require sim cards. Correct, but fallback for CDMA networks do NOT. And, ONLY AT&T (soon T-Mobile) and officially unlocked iPhone 5s (model A1428 old and new coming this month) from Apple work with LTE for T-Mobile (and AT&T). None of the CDMA-based iPhone 5s will support LTE for AT&T nor T-Mobile. Since it’ll enable the LTE toggle I guess there won’t be any way to disable 3G anymore? Considering I still don’t get 3G most of my day I’d like to continue save a little battery. Trust me with the iPhone 5 you won’t notice a difference in battery life with LTE on or off. It’s pretty efficient. I can return my unlocked iphone to apple by the 6th, is it best for me to return and wait for the tmobile iphone or this ota make my unlocked iphone work the same? im currently on really crappy 3g that drops and has bad reception. Return it on the 5th and pre order the iPhone on April 5th. Get the T-mobile version as the current unlocked iPhone won’t be able to get HSPA+ on T-mobile in many areas. THIS IS A HOSE JOB. Go to Verizon and hose yourself for an extra $60 months. After all, you overpaid for the iPhone without AWS HSPA… that’s your fault. what matt wilkins said. having HSPA+42 as a fallback on AWS would be AWSome. Non related comment: will there be an unlimited data plan for LTE? I’m using my unlimited data on GSM, GPRS, EDGE, HSPA+, LTE on my Z10. Yes, the regular unlimited plan the we have now for $20 includes LTE and everything else. Do you understand how much this post made my day? Finally after 4 years of not having Visual Voicemail, our time is now. yeah? there are only THREE places in the US with T-Mobile LTE… good luck with taht. You don’t need LTE to get visual voicemail. Your comment makes no sense. So you need LTE for vvm to work??? Doesn’t it also work on 3G? Actually seven markets officially rolled out, and LTE can be found in numerous other spots unannounced as well. An i, separated from its Phone. As long your device can download the carrier update, you will get Visual Voicemail (granted that you have this FREE feature enabled n your account). Group messaging only works if everyone in the group message has an iPhone. Its so annoying. I hope this update fixes that problem and keeps it in one thread. This is not a software update. It is a carrier bundle update. Group Messaging does NOT require everyone have an iPhone. I’ve gotten plenty of replies as part of a group that were NOT coming from iPhones. I hate group messaging. When someone sends me one, I get tons of replies from people I don’t even know. It works even if everyone doesn’t have an iPhone. Android doesn’t have native group messaging support though so those users won’t be able to have their replies show up in the group thread unless they use a third party messaging app like Go SMS. The update says to include AWS HSPA+ and AWS LTE (at&t/tmo versions)as referenced at end of course training and subject matter tests for iPhone 5 on T-Mobile. Anyone that’s worked for Tmo can tell you that information is sometimes wrong but with the hardware being exactly the same I see it likely to be true. Where u see that at? My thought, too. I guess I’ll have to pony up the extra $10/month for those times when I use hotspot. There probably won’t be a jailbreak for this update. Isn’t hotspot already included for free? What if you plan on using an iPhone 5 later with T-Mobile but right now it’s on AT&T? Will you ever receive the update if you don’t have a T-Mobile sim in on that date? Jeremy: When you finish your contract obligations with AT&T, you tell them that you want to unlock your iPhone. AT&T will help you do that, then you go to the T-Mobile store to get their micro-mini-SIM chip. In most cases they will set up the iPhone to take the best advantage of T-Mobile’s services. Once your iPhone 5 is unlocked (if it isn’t already), just pop in the T-Mobile NANO SIM card. The carrier update will be applied. Because even if you’re not in one of the initial 7 LTE markets, you’ll still get fast 3G HSPA data speeds…with no gouging over-charges & strong-arming by AT&T or Verizon. Their long-time iPhone duopoly is done. Remember that even though only 7 markets are announced as complete, there are pockets of LTE in many other areas where it is still being worked on and many of those areas will be announced as complete in the coming months. Can someone answer my question here. So I have a unlock/ jailbreak iPhone 5.
form the update? I would like to keep my JB but if not i will update. Naturally, there’s a difference between the legal unlocking and the illegal jailbreaking of the iPhone. If your iPhone is unlocked, there should be no problems, but if it’s jailbroken, you will probably need to wait until you get the okay from the jailbreaking programmers. okay but what about the software update to get LTe? is there any differences form what i have now? i did the Enable LTE Early on jailbroken iPhone 5. there was a article on here on how to do it. So is it worth to update when come out? Or just keep what I have now? You won’t have a choice. This OTA update is installed automatically, and it WILL NOT have any effect on the jailbreak. The only thing you’ll see is a popup on the iPhone saying a carrier update has been applied. The end user does nothing. But isn’t the OTA disable because of the JB? Dose this conflict with me doing the early LTE config? Is it worth the update or keep the early LTE enable that most of us did.? Okay I just check my packages and I don’t have it install. But kno the OTA is disable. I didn’t get a OTA for 6.1.3 and when I Jb my iPhone on the evasion website they say they will disable OTA just. Hahaha, Lumia user, you get no love, iPhone that someone else sold you…sure we’ll hook you up. I’ve been using an iPhone 4 on T-Mobile, so no LTE for me, and since I’m just a Pay-As-You-Go user, I’m not sure whether I’ll be getting access to visual voice-mail. But, I am so happy that T-Mobile will have the iPhone 5 and will provide them with LTE speeds. T-Mobile has always provided great support for the iPhone, even back when you could only jail-break the iPhone to get it. And, I especially appreciate their re-farming efforts to get G3 for my iPhone. :-) Good work T-Mobile. This update WILL provide visual voicemail etc. to T-Mobile prepaid iPhones as well. Thinking about getting a part time job as a sales rep and ride this wave! If your current Galaxy S is roaming on T-Mobile and getting 3G/4G speeds, then a T-Mobile branded Iphone should give you the same. As long as your carrier has a 3G/4G roaming agreement (which they obviously must) and the phone is capable (which a T-Mobile branded Iphone would be) then you should be fine. Does thi update mean that the Network will improve on ALL iPhones? like full bar 3G? This is not a “software update”. It is a carrier bundle update. but until you are apple’s software engineer that creates the packages stfu cause you don’t know what there going to do till they do it bye bye now…..
Thats good news. As far as the other “features”, I hope I can uninstall the TMobile bloatware. iPhones don’t, and NEVER have, been sold with carrier bloatware of ANY kind. We’re not talking Android here. That’s one of the severe downfalls of Android’s “freedom.” It’s freedom for carriers first, and consumers second. There’s no bloatware on iPhones. The one decent thing is Apple doesn’t allow it. T-Mobile like any other carrier cannot send any update to any iPhone. OS and firmware updates on Apple devices are pushed from Apple and only from Apple. So the title of this article is wrong. so does this mean that current AT&T IP5 will have the same radios/bands as the Tmo version after Friday’s update? This is gonna take them over the top, wow. Go TMo. Guys, are you even reading? The carrier update is OTA, it is for 6.1.x. You do not need to update update the firmware for this and you do not need to remove your jailbreak. So with this update will we be able to get T-Mobiles HSPA+ until LTE hits our area? I was just wondering because I know the new iphone coming out will get it. It would be nice to be able to keep my same unlocked iphone 5. No. You will need to get the new iPhone model coming April 12th otherwise you will only see 3G in refarmed areas. THIS IS A HOSE JOB !!!! can you still use T-zones on a current Pre-tmobile iphone without the data upsell?? I know if you purchase directly from tmobile, you’ll get the upsell, but what about the current iphones that get this update??? Does this include the iPad Mini to use T-Mobile LTE? Does this applies for the iPad Mini to? what if I jailbreaked my device and blocked OTA? I think it great that tmobile is finally getting the iPhone. But the coverage is something people should be worried about. I was with them for 10 years and seen no improvement in the network. They still in the 2G network and their main focus is not the speed of the phone not the phone quality. Paying for the phone full price will not bring a lot if people with drop calls. Does anyone know if this update is coming to the iPhone 4S factory unlocked to add theses features and enable the 4G Symbol on the top bar like the AT&T iPhone 4S? in regards to the new plans, is it the 2GB or Unlimited ONLY to choose from? That’s all i see on their website the last few days, i thought you got 5GB up to 12GB plans as well? Something change? You still get the other options, but you need to pick the +2GB option first. However, only look to those options if you need tethering. If you don’t need tethering, Unlimited is the better option. What about the Verizon iPhone 5? I’m pretty sure it will enable VVM and T-Mobile specific APN settings like it would for other iOS devices, but not enable LTE or AWS HSPA+ as that is hardware specific to at&t/T-Mobile/unlocked and ‘T-Mobile-optimized’ iPhone 5 models, respectively. One side effect: you should be to disable the [useless for T-Mobile purposes] LTE radio in the VZW iPhone when this carrier update gets pushed. Lets hope they keep the 3G/”4G” toggle switch too in the carrier update. I still can’t get any confirmation that the A1429 will be getting this update. I know it’s the verizon version, but I can’t get anyone to confirm or deny that only the A1428 will be getting the update and LTE support. How is it going to work for users of unlocked IPhone 4/4S? SMS, MMS, iMessage works perfectly as of right now for me and been seeing 3G in my area more and more so I’m a happy camper…however we are still missing the visualvoicemail..are we also getting it? I can confirm now that the iPhone 4S and 5 will display the “4G” icon on T-Mobile after this update. Can you give evidence for your proof? So how does this update work? Is it just like any other firmware update? If you don’t have a data plan on tmobile and still have an iPhone on the network, will you get the update..? No. Your iPod will not get it with a cellular plan. Anybody see this OTA update yet? Curious to see the impact on my 4S.